Our luscious butter literally melts into your skin for penetrating nourishment. 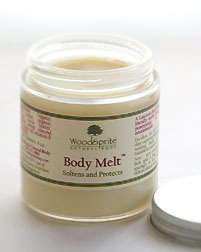 Leaves skin feeling softened, supple and protected all day! So gentle and versatile, Body Melt is excellent for very dry, chapped or delicate skin, such as for expectant or breast feeding mothers, as well as the toughest hard working hands. Highly effective, very long lasting. Superb emollient for manicures and cuticle care. Natural chocolate scent from the Virgin Organic Cocoa Butter fades quickly, so it won't interfere with perfume or other personal fragrances. This has consistently been one of our best sellers since we began making and selling our natural products back in 1998; the ingredients are so simple, but the formulation has stood the test of time. How to Use: Body Melt is unlike most other butters and creams on the market, as it contains absolutely no emulsifiers, chemicals or fillers of any kind. A true butter, Body Melt is very concentrated--just a little dab goes a long way. When used properly, it absorbs surprisingly fast, with no greasy afterfeel. Where to Use: Hands, feet, elbows or cuticles. 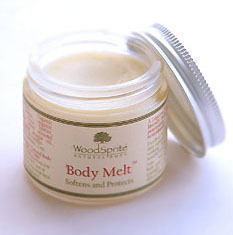 Expecting and nursing mothers, Body Melt is terrific for helping to prevent stretch marks and, since it is made from entirely food-grade ingredients, is excellent for preparation in breast feeding, as well as for baby's bottom...anywhere you need it! I bought this for my sister for her first Mother's Day and she just raved about it! I figured she was due for some pampering, but, especially with my nephew having some skin problems, I wanted to get her something without any chemicals in it. I'm glad I was able to get her something nice and feel totally at ease with it.